ghetto tyylit: We are newly located in Vallila! We have moved from the Pengerkatu 15 street-level glass box to the beautiful & rugged Vallila industrial district, 1,7 km Northwest. 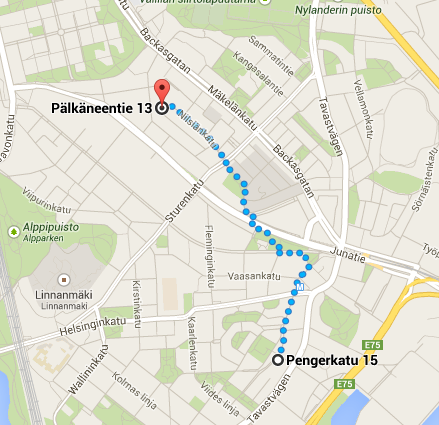 Our new address is Pälkäneentie 13 B (room 339). It is on the top floor of an old factory building, which is turned into an artist commune. It's the same entrance to the Vallila skate-hall, right next to Ääniwalli club. Of course the place is much different to our previous spot but I think a more raw, industrial & peaceful spot suits us better. There is also tons of new opportunities that I'm super excited about! We'll get back to those later.